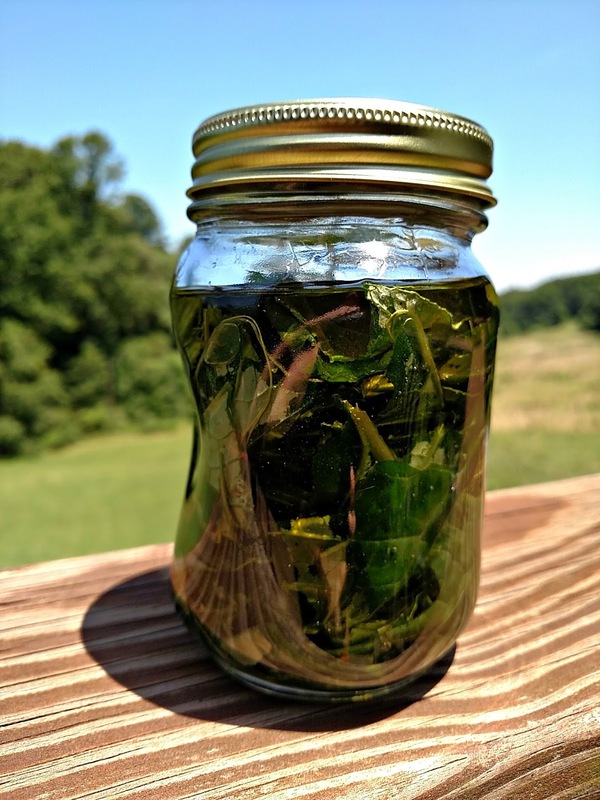 Last month I made my first healing salve. My parents gave me some comfrey for the garden, and it took off. I picked some and layered into olive oil, then let it sit in the sun for two weeks so it would solar infuse the comfrey into the oil. I used a mason jar that was warped, since I didn't want to put this jar through the canner. After two weeks were up, I strained the oil and made the salve by adding beeswax, plus a couple of healing essential oils. 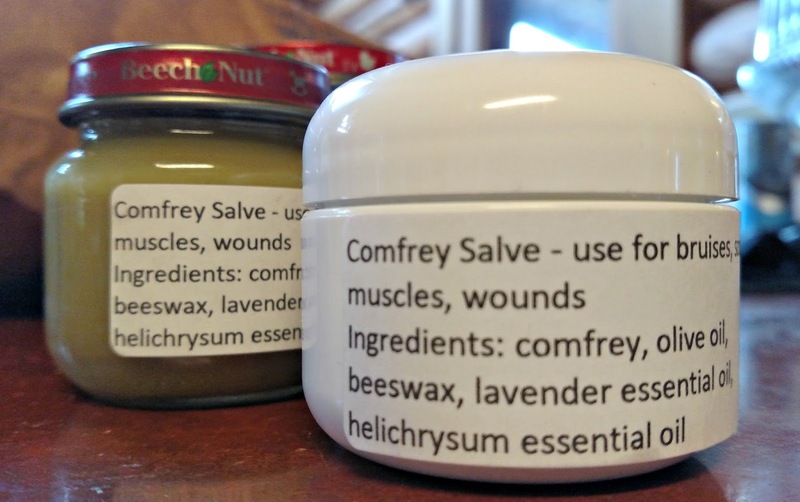 Comfrey is one of the best known healing herbs - perfect for bruises, cuts, sprains and wounds. I got a sunburn one day from taking the boys to a water park (I used sunscreen, but didn't realize it was expired by a couple of years). I put the comfrey salve on it and it diminished the pain immediately - it felt so soothing. Paul got welts on his skin from removing a bandage, and he used the comfrey salve and found it speeded the healing and took away the itching. I need to make some more! I made several jars, but everyone wanted some (which made me happy - I love to share the things I make). It's so handy to have in the medicine cabinet. I still have a big jar for us, but I thought maybe I should make another batch just for sharing. We have plenty of comfrey in the garden, so this will be a good project in the coming weeks. That is so cool! You are one smart lady! I love your sense of curiosity and willingness to try making some of the things you learn about. This salve does sound soothing. Can't you make a tea from comfrey too? Does that have medicinal purposes too? Never heard of Comfrey, but my wife and I have a MASSIVE Aloe plant on our porch that we've nicknamed Dr. Al. Anytime one of us has a burn or a cut, we just slice of a frond and mix up the gel. welcome to the world of wonderful herbalism.. i love comfrey and all its magical properties - well done it looks glorious! I find this so interesting. I have heard the name comfrey all my life, but never knew what is was! Gosh, spell checker doesn't even recognize the word. They want me to use comforter. Do they grow most everywhere like weeds, or do you have to cultivate them? If I have ever seen any, I would not recognize it. You know so much about these things, and put your knowledge to use. You remind me of one of those old fashioned mountain healers. Herbs and plants were the first medicines, made by God. I love that your making things like this. Sounds really good! You are very smart. What a great idea and such a nice gift for anyone. John and I are all cut up and bruised from the move. In an emergency, we use Vaseline for healing. What a great save. Totally natural and soothing. I have heard of it. I used to have a book with natural remedies. I would love if you shared at our link party every Sunday at 4:00 EST, Dishing It & Digging It. Happy weekend. That does sound great for bumps and bruises. Way to go in making your own. I've heard of it. I imagine the lavender gives it a nice scent. That is definitely the kind of thing you want to have around in the house. I think it sounds great! Wow Lisa - you do the most amazing things! I need to find how to make some for sinusitus,,, that I did not know I had,, until the endoodonist said so. You know how to make everything!